Canadian union turning up the heat on GM after plant closure announcement, 4,000 GM employees expected to lose their jobs, Brexit contributes to Nissan cutting X-Trail from UK production plans, MIT professors suing Ford and more in The Morning Shift for February 4, 2019. 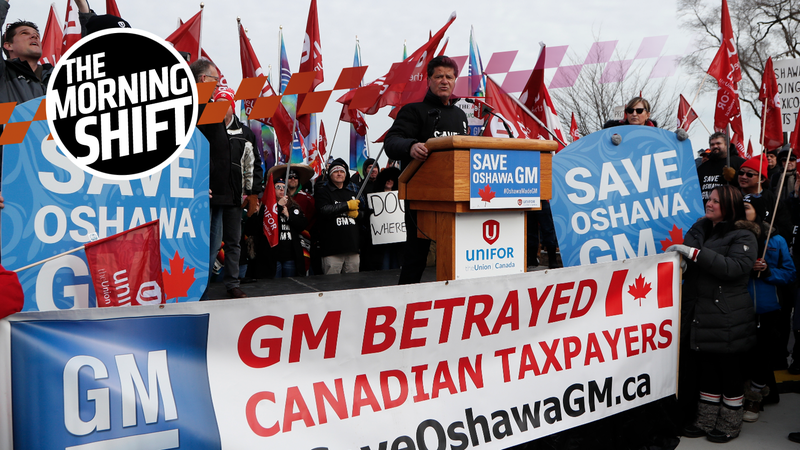 The Canadian trade union Unifor is pissed that GM is shutting down the Oshawa Assembly Plant, which has a long and rich history spanning over 100 years. GM says on its website that the facility—which now builds the Cadillac XTS, Chevy Impala, Chevy Silverado, and GMC Sierra—has been open since 1953, but that before that, it built McLaughlin Buicks and Chevrolets prior to The Bowtie merging with GM in 1918. Despite all of that history, in 2018, GM announced plans to close the historic manufacturing site. Shortly thereafter, workers walked out in protest, and the president of Unifor, the trade union representing the plant workers, voiced his displeasure, saying “They are not closing our damn plant without one hell of a fight,” per CTV News. Seems like Canadian workers are not going without a fight. “While GM respects Unifor’s rights to protest, we cannot condone purposely misleading the Canadian public. The new Unifor advertisement scheduled to air during the Super Bowl is misleading and inaccurate. In response, GM can confirm its lawyers lodged a formal demand to Unifor to cease any and all publication of the ad. The plant closure in Canada is just the start, as there is more PR nightmare—and more importantly, a loss of jobs—expected, with GM preparing to lay off over 4,000 employees. And it’s supposed to start today. In November, GM announced plans to cut 15 percent of its 54,000 salaried employees in North America including slashing global executives by 25 percent. The announcement followed 2,250 white-collar employees agreeing to voluntary buyouts — below the company’s target of roughly 8,000. The automaker, which previously said the layoffs would occur in the first quarter, started cutting some white-collar contract workers in November. The cuts to contract workers, according to one source, were around 1,500 — bringing the total number of employees who have already left the company to 3,750. That leaves GM with roughly 4,250 additional positions that still need to be cut. Days like these are the ones that employees—whether they’re laid off, or their friends are—will never forget. Some are calling it Black Monday. Understandably so; is a dark day for GM. “This is the implementation of the salaried actions announced late last year. These actions are necessary to secure the future of the company, including preserving thousands of jobs in the U.S. and globally. We are taking action now while the overall economy and job market are strong, increasing the ability of impacted employees to continue to advance in their careers, should they choose to do so. While Britain’s impending exit from the EU has caused uncertainty for the Sunderland plant, which exports roughly half its cars, the decline of diesel across the continent was a more significant factor, according to people familiar with the company’s thinking. The X-Trail is a large sport utility vehicle, the biggest passenger vehicle made by the Japanese group, and it had planned to make diesel models in the UK. In addition to alleged issues with emissions compliance, the story goes on to say that Nissan has already promised to get rid of diesels from its lineup, and that, to make gas X-Trails in Sunderland would “require shipping engines from Japan, something the business considered commercially unviable,” the news site attributes to an unnamed source. Dieselgate. Brexit. They’re both silly names, but their effects on the automotive industry are anything but. If you’re a mechanical engineer, there’s a good chance you’ve heard of John B. Heywood, the MIT professor who wrote the ubiquitous Internal Combustion Engines Fundamentals text. Now his name, as well as the name of two other renowned professors, Dr. Bromberg and Dr. Cohn, is on the front of another document, but it’s not a textbook: it’s a legal document accusing Ford of patent infringement. The lawsuit involves The Blue Oval and Ethanol Boosting Systems, LLC, a company created by the three aforementioned scientists, who assign their inventions to MIT, but license them out through the company. The lawsuit alleges that Ford infringed upon four patents, including this one, this one, this one, and this one—all of which have to do with dual port and direct injection, a technology that Ford has mentioned a number of times in advertising, and which we’ve written about multiple times. ...each of the Asserted Patents recites ways in which an engine or fuel management system employs both port and direct injection such that, at certain torque values, the engines are fueled by both simultaneously. Further, in some embodiments, the fraction of fueling provided by direct injection decreases with decreasing torque. Further, in other embodiments, port fueling alone is utilized when torque is below a certain value. January is, generally, not a great month for car sales as it is, but this past month’s numbers are in, and they were worse than last year’s January figures, Automotive News reports. The news site cites high interest rates, cold weather, higher sticker prices, and the government shutdown as reasons why sales dropped by one percent compared to January of last year. We’ll see how it goes. We’ve been hearing about sales declines for a long time; who knows when the steep cliff is coming. Neutral: Which of the Above Gears Concerns You Most? Nobody likes bad news, but all five of the gears above are fairly negative. There are people getting sued, folks losing their jobs, plant closures—it’s bleak. Of the gears, which one worries you most, and why? This story has been updated with GM’s response to Jalopnik’s inquiry about planned layoffs and the Unifor commercial.